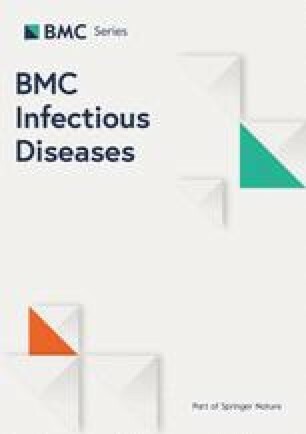 Acute invasive fungal rhinosinusitis (AIFRS) is a life-threatening disease, affecting mostly immunocompromised patients with neutrophilic dysfunction [1, 2, 3]. In these patients, saprophytic fungi, particularly Zygomycetes and Aspergillus, can invade the nasal mucosa and blood vessels, leading to rapid dissemination into the orbits, palate and the brain [2, 3, 4]. For this reason, a systematic review states that the overall survival rate of AIFRS patients is as low as 50% . Early diagnosis and immediate treatment, including antifungal therapy and surgical debridement, are considered vital for better survival rates . Formalin-fixed paraffin-embedded (FFPE) histopathological exam, including hematoxylin-eosin (HE) and Gomori methenamine-silver (GMS) staining, is the most reliable test to confirm fungi invasion into the tissue [3, 8, 9]. However, processing for FFPE is time-consuming, which contrasts with the urgency to diagnose AIFRS. To obtain faster results, some groups have advocated the inclusion of frozen-section biopsy [5, 9, 10, 11, 12] in the evaluation of patients at risk. 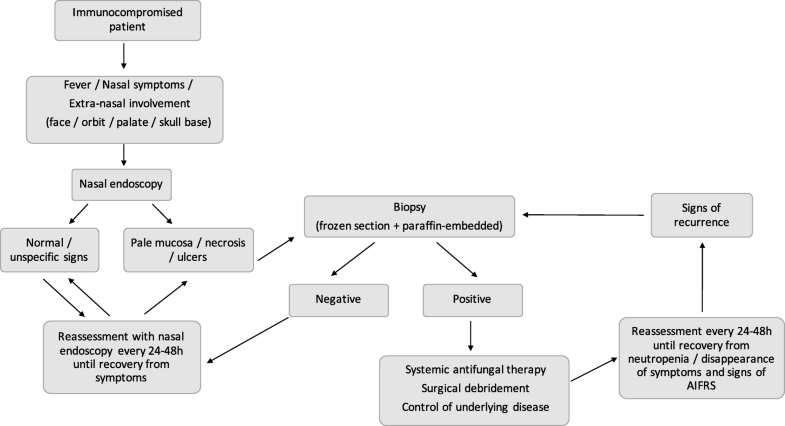 In most of these studies, frozen-section biopsy during surgery has demonstrated moderate to high sensitivity and specificity when compared with FFPE histopathology. Another contribution to detect AIFRS in early stages was the performance of frozen-section biopsies [3, 4, 10, 15, 16], the presence of artifacts during the freezing processing is still concerning. In our cohort, we observed that frozen-section and paraffin-embedded biopsies were well correlated (accuracy of 86%). Our accuracy is quite similar to previous reports in literature [5, 9, 10, 11], showing high sensitivity and moderate specificity. However, three patients in our cohort presented positive frozen-section but negative paraffin-embedded biopsy, and this might have occurred because in our study small samples were taken under local anesthesia in awake patients for the frozen-section and paraffin-embedded biopsies, while in other studies they were obtained intra-operatively [5, 9, 10]. To the best of our knowledge, the present study is the largest series of patients that specifically used frozen-section biopsy for the diagnosis of AIFRS.